* Electronically typed and edited by Juan Schoch for educational research purposes. To support the acquisition and sharing of texts such as this I am welcoming and encouraging any donations. Also donations of texts are welcome. A free way to get me and yourself $5.00 is to follow this link and sign up for PayPal -> https://secure.paypal.x.com/refer/pal=pc93%40prodigy.net Alternately I can be contacted at pc93@bellsouth.net Thank you and much exuberance! Truth to tell, for three hundred years the world of Poesy and Dramatic Art has been obsessed by an UNCOUTH HALLUCINATION. Perhaps one farre offe golden morning Titania will awake from her dreaming, and realise THAT FOR UPWARDS OF THREE CENTURIES SHE HAS DOATED ON A CLOWN. Harold Bayley. Ladies Guild of Francis St. Alban. 95, Parliament Hill Mansions, Lissenden Gardens, N.W. was delivered by Mr. H. CROUCH BATCHELOR, at 10, Wetherby Terrace, S. W., at a Sessional Meeting of THE LADIES GUILD OF FRANCIS ST. ALBAN. Mr. WILLIAM WRIGHT SPONG in the Chair. THE CHAIRMAN briefly opened the proceedings. Macaulays celebrated essay on Bacon is on the whole injurious to Bacons moral character, and seems almost to exalt his intellect at the expense of his honour. I believe that later in life Macaulay stated that this was the only one of his essays which he regretted writing. Well he might do so, for with his popular style he captured the ears of the groundlings and has affixed a stigma to the name which for the majority of people has proved practically indelible. Not that the man in the street ever takes the trouble to think for himself, or concerns himself with so sublime a subject. The stigma only seems indelible so long as no attempt is made to erase it. Intelligence and truth are its instantaneous solvents. In the meantime, in the region of pure intellect, Bacon, by the admission of all civilised mankind, stands supreme. He was the Founder of that process by which truth in every section of human thought has been attained, in contradistinction to the universal habit, before he rose like the Sun to dissipate ignorance and superstition. Before he appeared all thinkers approached the problems of life and phenomena with preconceived ideas as to how they OUGHT to be accounted for. They formed their à priori theories, their syntheses, and then proceeded to twist and bend their intellects to subserve those preconceptions. It was reserved for Bacon to emancipate himself from this habit, and to deal with facts and phenomena on their actual merits, to observe them carefully and to deduce from them rather than attribute to them. No matter what men had believed before his time, he had only been in the world a very few years when it struck him that these old ways, this tyranny of unsupported beliefs were nonsensical, and that there is a light within man which, if he would allow himself to regard and be guided by it, would lead him onwards upon solid ground to a happier region than he had ever discovered in the then past ages. Bacon incarnated the new birth of the human mind and soul. What then might we expect to find as characterising all his writings? The answer is COMMON SENSE. Before his time it was the most uncommon quality on earth. What is one of the most distinguished qualities of all the Shakespeare literature? Common sense. I have never read one of the plays without being struck with this. When we think of the author of those plays how incontestably we form an idea of a being of mild, benignant common sense, of intensely human sympathetic nature, whose wit, whose sarcasm, whose poetry, whose imagination are all subdued to that medium of common sense in which it is evident that the author always worked. That is the reason why this literature has taken such a hold upon mankind. For not merely was the author a man for all time, but for all men. It is the Germans who say they actually discovered Shakespeare. The French love him hardly less. Our children the Americans we know regard him-that is the Author-as semi-divine. Pilgrimages to the shrine of Stratford-on-Avon have been almost as numerous as to those of all the nominally sacred religions, and, it is to be feared, with as little basis of objective truth as is possessed (we shall all admit this deficiency in regard to the religions we dont happen to believe in ourselves!) by many of them. Bacon was the pioneer of common sense methods, and the Shakespeare literature is impregnated with that curious, and before Bacons time, rare quality. But the years 1561 to 1626 were a dangerous period for common sense. Any one who started up to contradict received opinions and persisted in running his head against the ramparts of ignorance, prejudice and the vested interests of the epoch, would be certain to break it, even if Elizabeth or James did not cut it off. Therefore, any one with the ultimate good of his fellow-creatures and their posterity at heart had to be extremely cautious and to proceed very slowly. He must convey the precious seed he bore in special vessels and sow it in suitable, sheltered places, unless it was to be lost or blown away. This consideration brings me to the necessity of glancing for a moment at the air of esoteric mystery which, apart from all suggestions of Bacons authorship of the Shakespeare literature, is associated with Bacons acknowledged work; I do not say of all his works. 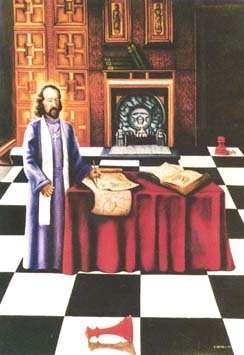 But what seems to have been the impulse which moved an English lady, Mrs. Pott, to found this Society and to devote fifty years to the study of Bacons career is the belief that Francis reformed a secret society-the Rosicrucians-the purpose of which was to keep alight and hand on to future ages the lamp of knowledge. I cannot now, nor probably should I personally ever be competent to deal with this aspect of Bacons phenomenal existence. It is the study of a life-time, and the more efficiently Bacon might have directed that society, the more difficult must it necessarily be to lay bare its workings. I believe there was, and is, such a society, and I am inclined to think that its secrecy has outlived the period prescribed by Bacon, and that many keys, or open sesames, have been lost. Meantime we have Mrs. Potts wonderful book, Francis Bacon and his Secret Society, containing amongst other things hundreds of diagrams of paper marks, and these alone are fraught with fascinating interest and suggestions of thrilling possible meanings. birth, life and work, and his modus operandi with reference to the Shakespeare plays by name, is clearly stated, and I am bound to say that the narrative, as partially quoted in Mr. Harold Bayleys book The Tragedy of Sir Francis Bacon, is of such a remarkable character, so original a dialectic, in such exact reproduction of the contemporary orthography, and records such strange thoughts or facts-if they be facts-that it is hard to believe that Mrs. Gallup, or any one else, invented them. All I hope to accomplish by this paper is to disseminate truth in new directions; to arrest the attention of those to whom the whole subject is fresh. They who are best acquainted with it will most appreciate the immense difficulty in making a selection of the salient points. I ask at once, Suppose it be provable that Shakespeare of Stratford did not write Shakespeare, who else could have written it? I challenge any educated person of any nation to suggest any other name than Francis Bacon. I will not labour this point. It will be generally admitted, notwithstanding that a lively German within the last two years announces that the real author was the Earl of Rutland. The earl was named Manners, the name of the present duke, and it is a very curious coincidence that after Shakspur of Stratford had retired from the stage, it appears from records lately unearthed at Belvoir Castle he was, in 1613, actually employed in some work at the castle-the painting of emblems, or some such matter-for which he was paid, with his friend Burbage the actor, 44 shillings. It is incontestable that Shakspere was at Belvoir doing some not literary work for a small remuneration. This scarcely renders his authorship of the literature more probable. Well, let us agree that if Shakspere, of Stratford, did not write it Bacon was the only living man who could have done so. I said I would deal with the question on the basis of probability. Probability in this case almost postulates sanity. I speak of Shakspur, as distinguished from Shakespeare. Why? Not because I attach much importance to the spelling of the name. In those days thought was as advanced, as subtle, as refined, as deep and wide-embracing as it is now, or ever can be. It is the Shakespeare literature which proves it. But the orthographical mould into which that thought was to flow was by no means settled. The orthography was still in a state of flux. So you will find Bacon himself sometimes spelling the same word differently on the same page. I could feel no assurance in an argument based upon the spelling of the name of the person called by us moderns William Shakespeare, but who himself never spelt his name that way. There are twenty or thirty different ways in which the family of this Stratford man spelt their name-Shagspere, Shaxper, Shaxburd, Shakspurre, &c.-and in the only admitted specimens of his handwriting, the five signatures, the name is spelt Shakspere, or in the last discovery at the Record Office (a sixth signature)-Will Shak. In the Marriage Bond of 1582 it is spelt SHAGSpere. This, therefore, establishes the fact beyond dispute, that the name Shake-speare did convey the idea of Wisdom attacking Ignorance and that it was not necessarily the name of any living person. That is a very great thing to establish. The best that could be said by a defender of the Stratford faith would be that Jonson was punning upon the name of Shakspere. But why should he do so? Why make a pun, when the actual name as printed conveyed the meaning? We know that this was not the actual name of the author. Jonsons epigram was prophetic, for there are plenty of sluggish, gaping auditors still extant, ready to accept anything without examination! representations, that it was refused, but that ultimately in some way not made very clear it was granted. The man was wealthy and he was vain, and what we should call nowadays a snob. Now, again reverting to probability. It is time we considered and contrasted the known facts of the lives of Bacon and Shakspere of Stratford. persons who went into the Globe Theatre. Tradition supports this, but it is not knowledge. We know that in 1593 Shakspere was a member of a company of players who in that year appeared before Queen Elizabeth. But in the Groatsworth of Wit we have seen that he was parodied as Shake-scene, so that between 1585 and 1592 he must have made a sufficient mark to have elicited from Greene the very unflattering opinion expressed in that work. Now it is quite natural that mouthing others words and buying the reversion of old plays, etc., might have been accomplished in that period, but it is impossible, short of a greater miracle than any recorded in scripture, that he should have written various plays, all exhibiting wide knowledge, and especially the most learned of all, Loves Labours Lost, which is an irony and sarcasm upon scholastic learning, involving profound classical knowledge in its author. Remember that books were not easy to obtain in those days, and that Shakspere had to get his living and would have little opportunity for study. made a fortune by theatre keeping, and, as we all know, devoted it to founding the College of Gods Gift at Dulwich, one of our most admirable and wealthy schools. Henslowe, from 1591 to 1609, kept a Diary, in which he entered day by day the money taken for performances, the sums lent by him to the needy authors whilst writing, and for the purchase of the Plays when completed. Here we find the names of many of the known writers, Decker, Chettle, Marston, &c., including Ben Jonson. But not a single reference is made to Shakspere, either as actor or author. Perhaps never did negative approximate more nearly to positive evidence. Conspicuous by his absence, indeed, is the Stratford Genius! We know that Shakspere bought his house, New Place, at Stratford in 1597. In 1598 he figures as holding ten quarters of corn at a time of famine. He was selling stone there in 1598. In the same year Richard Quiney, who subsequently married his daughter Judith, wrote a letter asking for a loan of £30. This is the only document in existence addressed to Shakspere, and I need not say that none exists from him. We find on the records of Stratford, from 1599 to 1605, several transactions indicating that he was lending money, buying parcels of land, suing people for petty debts. In 1607 his daughter Susanna married John Hall at Stratford. In 1613 Shakspere buys and mortgages a house in London. On February 11th, 1613, Judith marries Quiney without a License, and they are arraigned before the Court at Worcester for violation of the law. Judith was then 26, but could not read or write. She makes a mark. But Shakespeare says in the second part of Henry VI. ignorance is the curse of God, knowledge the wings wherewith we fly to heaven. It is difficult to understand why Shakspere doomed his daughter to so evil a condition! On March 25th, 1616, Shakspere makes his Will. On April 23rd he died. That is all we know of the reputed author of the greatest literature on earth. Yes, we also have his Will and see that every item he possessed, down to the minutest, is disposed of, that nothing was left to his wife except by an afterthought and interlineation, his second best bed; but there is not one book, nor scrap of printed paper, nor MS. Nothing about copyrights of Plays or poems, many of which had yet to come before the world, as we shall see later on. The Summary comes to this: all that is known with any degree of certainty is that he was born at Straford-on-Avon, married and had children there, went to London where he became an actor, and was reputed to be the author of poems and plays; acquired wealth; applied for a title which was refused; invested money in real estate and in the tithes of his native town; instituted many lawsuits; returned to Stratford; sold malt; entertained a preacher at his house, and drew on the town for one quart of claret wine and one quart of sack (20 pence) for the occasion; favoured a conspiracy to enclose the Commons there; made his will, died and was buried. And then his tomb. No one knows when the first monument in the church was erected, or who did it, paid for it, or wrote the absurdly unsuitable inscription which means that he was a Nestor in experienced judgment, a Socrates in philosophical genius, and a Virgil in poetic art. But, as late as 1636, there was a monument engraved in Dugdales Antiquities of Warwickshire, very different as regards the figure and the framework from that now existing. Mr. Greenwood had reproduced this, and the figure is that of a thin-faced melancholy-looking man, with no pen in his hand, and grasping what looks like a sack of wool. (Is this a practical pun on Bacon as the occupant of the woolsack?) Be that as it may, the figure resembles Bacon, and the inscription precisely describes him. It does not describe the money-lending local corn dealer. No one knows when the present monument and figure were erected, with its goggle eyes, vacuous and clownish expression, and a conventional pen in his hand. I have so far made a little original research for myself that I have written the vicar of the church and proved that there is no knowledge about the tomb. That seems a queer thing-an almost impossible thing, one would suppose! instance, who were allowed to have the free use of the book. Dulwich College took no note of the book; it was amongst lumber until Malone found it about 1780, and he was allowed to retain it in his possession until 1812. It seems incredible. J. P. Collier was allowed the free run of it in 1831, and to him may probably be attributed some of the forgeries. These are not all directed to Shakespearean associations, but the tendency is to suggest the existence of that individual. But the most remarkable indication of the unseen hand is furnished by the cover of a number of papers which belonged to Francis Bacon, found in 1867 amongst the muniments of the Duke of Northumberland. I have it here, reproduced in facsimile, in Edwin Reeds Bacon v. Shakspere. The contents were found complete, as indexed, except two of the Shakespeare plays, Richard II. and Richard III., which had been cut out. If only those plays had been found there! What a light they might have thrown upon our present investigation! Stratford Shakspere. Do you see any? How was it done? Simply by taking the literature and saying, The author writes this, that and the other, and therefore he must have been so and so. Quite right! and this disposes of Shakspere of Stratford. The life and attributes of the author, as inferred from the literature, are precisely those of Bacon and ridiculously unlike those of Shakspere. But the Stratfordians prefer imagining a miraculous monster to accepting the existence of an actual being. Instead of a tradition which naturally fades, we have the accretions of imagination and unfounded assertions continually added to it, backed by the vested interests of the amour propre of mistaken scholarship, and I may add, of the Railway Companies and hotel keepers, who would suffer enormous losses by the dethronement of the popular idol in his local habitation and name. One of the gravest difficulties a lover of truth has to contend with in this investigation is that moral character has become a factor, and the fanatical bias of the Stratford theorists is so strong that they-some of them-lie freely and in such a way as to involve self-detection. They garble extracts, suppress parts of sentences, metaphorically stamp and rave that they will not have it so, and abuse in the most reckless manner those who are not possessed by the same spirit. Here are some choice examples from Churton Collins and Sidney Lee. Lee says the suggestion that Bacon wrote the literature is a foolish craze, morbid psychology, madhouse chatter. We are suffering from epidemic disease, and unworthy of serious attention from any but professed students of intellectual aberration. This includes Lord Penzance, Judge Webb, Judge Holmes, John Bright and large numbers of the most thoughtful scholars, eminent in many walks of life and especially in the legal profession-those, in fact, most able to weigh evidence. There is not the slightest degree of probability that Shakspere of Stratford wrote the greatest literature in the world, and there is not one scrap of evidence that he ever claimed to have done so. He died absolutely unnoticed. Not a poem nor elegy was written about him who must have enjoyed boundless honours with troops of friends, had he been regarded as the great Poet and Dramatist and intimate with the Earls of Pembroke, Montgomery and Southampton. It was the fashion to write such elegies for every man who had made any literary mark. Thirty-two such panegyrics written at Bacons death are familiar to students. In 1576 Francis and Anthony are enrolled as students in Grays Inn. Francis then fifteen. In 1577 Francis went in the suite of Sir Amyas Paulet, British Ambassador to the Court of France. Being a well-grounded linguist from childhood he could speak French, Italian and Spanish. He is sent on a confidential mission by Paulet to Elizabeth and returns to France. He travels with the Court through the Provinces which are the scenes of 1st Henry VI. It is recorded that his conversation at this time excited the wonder of all who heard him, and there is a contemporary miniature by Hilliard around which was written in Latin, If one could only paint his mind! In 1579 he is still residing in France, settling mainly at Poitiers, but travelling to various European Courts to gather information about the characters and resources of their Rulers. phenomenal abilities of Bacon. In Hamlet Bacon is believed to have revenged himself by the character of Polonius, which caricatures Burleigh. Francis was therefore forced-in his own words-against the bent of his genius to the law as a means of livelihood, and he resides at Gorhambury, St. Albans-the scene of the second Henry VI. In 1581 he begins to keep terms in Grays Inn. In 1582 he is called to the Bar. As nothing is recorded of him except that he was engaged in studies, it is believe that at this period he sketched several of the Plays. There is evidence that a play Hamlet was acted at Cambridge in 1585. If that was the play we know, and of which (parenthetically) John Bright said that anyone who believed Shakspere, of Stratford, wrote Hamlet or Lear is a fool, it is certain that Shakspere did not write it, for he could hardly have arrived in London. The very earliest date is some time in that year. Anthony Bacon had been abroad since 1579, and did not return until late in 1592, but the brothers constantly corresponded, and Anthony acted informally as purveyor of diplomatic information to the Foreign Office, for something like a period of eleven years. In 1584 Francis wrote a letter to Queen Elizabeth full of remarkable advice, which she received graciously. His studies and occupations bring him no income, and he falls into debt. In 1586 he is made a Bencher of his Inn, but remains in such seclusion that it is invidiously commented on. This is the time when The Taming of the Shrew, the Two Gentlemen of Verona and Loves Labours Lost are first heard of, but the first very incomplete. In 1587 Francis helps to get up an anonymous Play, The Tragedy of Arthur. He also assists in masques to be performed before the Queen. In 1588 he enters Parliament-for Liverpool. Still a briefless barrister with any amount of free time. From 1579, when he returned from France at the age of 19, practically nothing appears from him until 1597, when he published his first volume of the Essays. Could so teeming a mind have produced nothing in these eighteen of the best years of his life? At the end of 1591 he writes an extraordinary letter to Lord Burleigh, which I will read from Mrs. Potts book. In this connection, too, I may fittingly read a letter written by Bacon to Sir Thomas Bodley in 1606, in which, although he had then been for some years employed in state business, he acknowledges himself unfit for it, and liable to many errors from the pre-occupation of his mind. The sonnets of SHAKE-SPEARE are supposed to have been composed about this time, although they were first published in 1609. Besides the Two Gentlemen of Verona, other comedies at this time reflect special local knowledge which might have come from Anthony in Italy. In 1592 Franciss intimacy with Essex culminated. Anthony returns, and the brothers live together in chambers at Grays Inn. They become secretaries to Essex, although he never paid them, but eventually Essex influenced the gift of a strip of land at Twickenham to Francis. Francis becomes desperately hard up and is found borrowing such small sums as £1. Later he is thrown into a sponging house by a Jew money-lender. Anthony mortgages his property and raises money from friends and pays the debt. The Merchant of Venice, with its Shylock and Antonio, appears soon after. In 1592-3 Francis composes a deice or play, A Conference of Pleasure. This was found in the Northumberland cover. One of the speeches in this play closely resembles Cranmers speech in Henry VIII., as well as certain of the sonnets. Venus and Adonis is published with a dedication signed Shake-speare to Franciss young and intimate friend, the Earl of Southampton. It is described in this dedication as the first heir of my invention, although ten plays had been composed between 1589-1593. Satires, Marlowes Ovid and several other books of the same class. In 1595 the plague broke out in London, and Bacon retreats to Twickenham with some congenial friends. There he employed a band of scriveners, or writers, pretty constantly, and a letter exists in which he asks for some good pens (writers), as he has work for them. Now we come to one of the most astonishing of all the indications of authorship. In the British Museum is to be seen (I have spent an hour or two over it) a MS. of Bacons called The Promus of Formularies and Elegancies, dated December 5th, 1594. This is Bacons private note-book, in which he jotted down a number of phrases and turns of speech which seem to have struck or occurred to him over a term of four years. Mrs. Pott undertook the tremendous labour when she deciphered these, for the spelling and the several languages constitute some difficulty, and gave the result of these labours in her delightfully convincing work, Bacons Promus. In this book she traces some 3,000 quotations from this private note-book of Bacons in the plays of Shakespeare. Most of these expressions had never appeared in literature before. Bacon made no use of them in his known writings, but there they are in the Plays. No supporter of Stratford William has ever condescended to try to give an explanation of this colossal coincidence. There are only two possible alternatives: either Shakspere borrowed Bacons note-book or Bacon wrote Shakespeare, and all obtainable evidence supports the latter conclusion. Shakespeare publications. It would take a week rather than an hour. There are innumerable indications, some of them intrinsically trifling, and yet any one of them practically setting up the authorship. As an example, one of the plays refers to a ferry near Pisa. Ages ago the canal was filled up, but no one could have known of so small a matter who had not happened to travel there at the time. All commentators for three hundred years were puzzled by this, but it has recently been found in Platos Phdrus, a work which had not been translated in Shaksperes time. And next we come to the broad fact which also cannot be explained except by Bacons authorship. The Shakespeare we all of us know is the 36 Plays contained in the First Folio. That was published in 1623. It professes to be a collection of Shakespeares Plays made by Hemminge and Condell, two fellow actors. Shakspere had been dead seven years. Hemminge and Condell sign a Preface, but it is not disputed by Stratfordians that this Preface was written by Ben Jonson. Ben Jonson also wrote the sarcastic verse facing the alleged portrait of the Stratford man, which certainly does not enhance ones ideas of his mentality. Jonson very significantly says, Look not upon his picture but his booke! About 1620 Bacon requested Jonson to go and reside with him at Gorhambury, and assist him in turning into Latin those scientific works, the Novum Organum and the De Augmentis Scientiarum, &c., upon which alone Bacon cared to rest his fame. He decided that Latin was the vehicle which would most securely convey his wisdom to posterity. Hamlet. But it was the time when Shakspere had finally acquired wealth, bought New Place, and was extremely prosperous, as he remained to the end of his life. Bacon unavoidably had to study those conditions in his mother during a period of eight or nine years. But Dr. Browne prefers to imagine a crowd of demented beings as haunting his Stratford puppet, to account for his special knowledge on this subject. So it is with all of the Stratfordian shrine makers. Shakspere doubtless was a lawyers clerk, to account for his knowledge of Law. He was doubtless a Schoolmaster for awhile, to account for his classical learning. They invent as they go along. Messrs. Lee, Collins & Co. have a mortal objection to the inductive method. Franciss fame is smothered by the very process he came into the world to destroy. Those who are now foremost in the files of Time, and who have no axe to grind, have abandoned it. There is no extremity of absurdity or wild imagining to which the Shakespearean scholar, as exemplified by Sidney Lee, will not resort to back up their fetish. Collinss statement that he was certainly able to read Greek, is the only useful contribution made by him to the cause of truth, for it renders the Stratford claim preposterous. Bacons life may largely be traced from the Sonnets, but the idea that these exquisite and courtly compositions relate to an obscure rustic then dealing in drysalteries and lending petty sums in his native town is irrational. The aristocratic tone, the contempt for the masses, and the opprobrious expressions applied to them as the mutable rank scented many, the intimate knowledge of Court life, the evidence that they emanate not merely from an accomplished scholar but a highly born gentleman, found throughout the Shakespeare literature, are alone sufficient to demolish the Stratfordian basis. GENIUS. Then they mention Robert Burns. It is childish. Burns was a genius, but he only worked with the materials-dialect and personal experiences-in his own sphere. Genius cannot give technical knowledge. Since the Day of Pentecost it has not gifted illiterate persons with the power of speaking languages of which they had never before heard. Instead of Poet-Ape and thief of the reversion of old plays, etc., he is apostrophised as Soul of the Age, etc. Yes, but whom was he apostrophising? Obviously, the person who figured as Shakespeare. He says of Shakespeare that he had equalled all that insolent Greece or haughty Rome sent forth. Ten years later he publishes a book of reminiscences of all the great men he had known, and then he applies these exact words to Bacon. He says of Bacons work that they are preferred either to insolent Greece or haughty Rome. This is not a coincidence-it is an express declaration. And in that same list of great men Shakespeares name is not mentioned, but Bacon stands first. He calls Bacon the mark and acme of our language. But time does not permit me to work out the connection between Bacon and Jonson and the apparent contradictions between Jonsons earlier and later utterances. The more it is looked into the clearer the reasons become. It will be asked, Why did not Bacon own the authorship? I have already given very strong indications in connection with the Cecils hostility. His enforced ambition for the Chancellorship-the woolsack-the hatred of his mother for associations with the theatre (her almost agonised letters on this subject exist)-the evil name attaching to a class known as rogues and vagabonds and liable to heavy penalties unless enlisted in the service of important personages or functionaries, such as the Lord Chamberlain-are quite sufficient to account for it. When he had lost his position he was still less willing to be identified with these works of his recreation, for he actually uses this expression when writing to his closest friend, Sir Tobie Matthew, to whom he was in the habit of submitting most of his productions. There are no such works except they be the Shakespeare literature. One enormously strong argument in my judgment, is that Bacon never once mentions Shakspere. But Bacon wrote ardently in favour of the stage as an educative medium, and deplored its degradation and that there were no dramatists capable of rising to its opportunities. He writes: Dramatic poesy is history made visible . . . . typical history . . . . narrative or heroical poesy . . . . truly noble, and has a special relation to the dignity of human nature; dramatic poesy, which has the theatre for its world, would be of excellent use if well directed, etc. It is inconceivable that when the star of Shakespeare, the greatest poetic dramatist of all time, arose, Bacon should not have thought it worth even a reference! Yet that there was a knowledge of the name is proved by the fact that eight times on the Northumberland cover the name of William Shakespeare is scribbled wholly or partially! Amongst the many things on the Northumberland cover occurs the word HONORIFICABILITUDINO. In Loves Labours Lost Costard says, thou art not so long by the head as HONORIFICABILITUDINITATIBUS. The latter is an anagram of the Latin sentence, Hi ludi tuiti sibi Fr. Bacono nati (these plays, entrusted to themselves, proceeded from Fr. Bacon). The word as abbreviated on the cover exactly contains the sentence, Initio hi ludi Fr. Bacono (in the beginning these plays from Francis Bacon). Bacon says in one of his Essays (XLVII. ):-In choice of instruments it is better to choose men of a plainer sort . . . Use also such persons as affect the business wherein they are employed, for that quickeneth much. This is a sufficient answer to the Stratfordian objection that such a prodigious author-genius as Bacon would not have used so ignorant a person as Shakspere for his counterfeit representative. Bacon, writing to his friend, Dr. Andrewes, Bishop of Winchester, regarding his Essays, says:-But I account the use that a man should seek of the publishing of his own writings before his death to be but an untimely anticipation of that which is proper to follow a man, and not go along with him. Whoever else among great and ambitious men held this strange doctrine of literary reserve? vocabulary and unique words which distinguish the Plays. Many were never used before or have been since, but all are invented in a strictly scholastic manner. Harold Bayley, in his Shakespeare Symphony, p. 209, gives a list of the new words by which various authors have enriched the English language. Bacon figures for 1,850 words, Shakespeare for 9,450! following:-The rising to honour is laborious, the standing slippery, the fall headlong. These expressions are used in Troilus and Cressida, played at the Globe in 1600; and they appear in Henry VIII. One of the first arguments of the Stratfordians is that Bacon could not have written poetry. With a doubtless and a could not you can settle anything! In a letter asking a friend to procure him a favour from King James Bacon speaks of himself as a concealed poet. The evidence that Francis was a poet is overwhelming, and only people ignorant of the subject believe the contrary. The Plays reveal such knowledge of law that the profoundest lawyers say that the author must have been a lawyer. Through all the writings it seems as if he could not get away from legal forms and allusions, some of them of the most abstruse character. The knowledge of navigation and the management of a vessel in difficulties, as shown in The Tempest, is precisely the right thing and such as an able captain would put in practice. In 1610 Bacon was a fellow member with the Earls of Southampton, Pembroke and Montgomery in the Virginia Company which sent a fleet to the West Indies. The fleet encountered tremendous storms, and the ship Admiral was wrecked on the Bermudas. In 1611 we have the expression in the Tempest, the still vexed Bermoöthes. It is highly improbable that Shakspere ever saw the sea. The fact that any of the Plays were published anonymously is much more remarkable if Shakspere wrote them than if Bacon were the author. There is no conceivable reason for Shakspere adopting anonymity. All the other way. He wanted to make his fortune and his fame. All that we know of Shakspere has no relation to his authorship, and it is also practically fatal to it. Is there any positive proof that Shakspere could write at all? His signatures hardly prove it, because a page of such calligraphy is well-nigh inconceivable. Bacon fell in 1620. From that date to his death he was engaged in hurrying to publication all his acknowledged writings. The De Augmentis, Natural History, History of the Winds, New Atlantis, Apophthegms, Third Edition of the Essays, with a great increase in their number, and especially that on Friendship, dedicated to Tobie Matthew, &c.
compared with those of the attribution to the Stratford actor. Otherwise, we have to assume that the greatest genius of mankind after attaining the deepest and widest culture, and living for 20 years in the highest society of his country, gave all up and retreated to a foul tenth-rate provincial town, occupied himself in pettifogging pecuniary transactions and retail trade-led, in fact, for years the life of a small tradesman-never wrote another line, and left not a book not a scrap of correspondence, nor a literary wrack behind him. THE CHAIRMAN suggested that owing to the intense importance of the recent valuable discoveries made by that indefatigable Baconian worker, Mrs. Chambers Bunten, at the British Museum of the original passports granted to Anthony Bacon by Marshal Biron in 1586, it would be most instructive and delightful if Mrs. Bunten would kindly narrate her discoveries-absolutely the most made from a Baconian point of view for some considerable period. I am convinced that Anthony Bacon and his brother Francis had much to do with writing Loves Labours Lost, which was produced on the stage in England the year Anthony returned from the Continent to London, 1592-3. Anthony had spent four or five years, off and on, in the Navarre Court, and become quite intimate with Henry IV. In fact, there is a hint in a letter that he held the office of chamberlain to his Majesty at one time, and it seems by the MS. letters, in French, to Anthony Bacon in the British Museum, that various sums of money were paid to him while in the Navarre Court. But it is difficult to judge if these sums were borrowed, or were the payments for information of secrets connected with politics. One of the most interesting letters is an original in the Kings bold hand to Anthony Bacon. Among other documents to be seen are various passports for Anthony Bacon, and one is signed by Biron, marshal of the Navarre army; another by Du Mayne; another by De Boyresse. It may be remembered that the plot of Loves Labours Lost has the King of Navarre as hero, and that the principal characters are called Biron (spelt differently in the first printed edition), Longaville, Dumaine and Boyet. These names belonged to officers and courtiers who were prominent in the Navarre Court between 1581 and 1590, and whom Anthony Bacon must have been very intimate with. He therefore used their names in Loves Labours Lost, and the Princess of France is, of course, Marguerite, who became Henry de Bourbons wife, and mounted the united throne of France with him in 1589. There is strong likelihood that Holofernes in the play is a skit on Anthonys Italian schoolmaster Florio, who was a teacher of languages in England, and translated Montagues essays into our language. The name Armado resembles the celebrated Armada which Spain had sent in 1588 to conquer England. We see that Anthony Bacon had all knowledge of the etiquette of the Navarre Court, which William Shakspere of Stratford could not have acquired. This is evidently an allusion to Banks performing horse which was called Morocco, and which did extraordinary tricks, and answered questions by means of letters. It was first exhibited in 1589, and there is still extant a broadsheet ballad, with a picture of the horse dancing, as it performed at the Belle Sauvage Inn on Ludgate Hill, London, at that date. PASSPORT [TRANSLATION] BRITISH MUSEUM ADD MS.
Poitou, Aunis, Saintonge and Angoumois. To all governors, captains, chiefs, and leaders of men-at-arms, both calvary and infantry, mayors, sheriffs, consuls, jurats of towns, and keepers of the gates thereof, provosts, judges, and their deputies, wardens of ports, bridges, tolls, passes, jurisdictions, and districts, and to all those whom it may concern. We pray those who are to be prayed, to order and command those over whom our authority and power extend, to let pass freely and securely through your districts and jurisdictions Le Sieur de Baccon (Mr. Bacon), who is going to England with his men, servants, arms, and horses, without causing or suffering any to cause him any trouble, obstacle, or hindrance, but rather showing him favour, and help if need should be. Given at the camp at Sanjou, the 27th September, 1586. A short discussion followed and the proceedings terminated with hearty votes of thanks to Mr. Crouch Batchelor for his delightful address and to Mr. Spong for presiding. Three Articles in the National Review. (January, February, September, 1909.) By George Hookham.